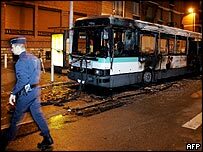 Youths in the Paris suburbs have attacked two buses on the eve of the first anniversary of rioting among immigrant communities. In Nanterre, northwestern Paris, about 10 passengers fled a bus as masked youths set it ablaze, police said. A similar attack happened in Bagnolet, eastern Paris, where a youth held a gun to the bus driver's head while others set it on fire, officials said. Police report a spate of youth violence ahead of the anniversary. Defence Minister Michele Alliot-Marie accused the youths of attempted murder in the latest incidents. A security services report leaked to a French newspaper this week said that the conditions that led to last year's riots were still in place. Several hundred youths, of largely African and North African descent, marched to the National Assembly in Paris on Wednesday to present a list of complaints to the government. They called for more action to tackle discrimination and more jobs and training for the young. "Lots of people don't believe what we're doing. They don't understand the potential," Abdel Zahiri, one of the marchers, told the Associated Press news agency. "The risk of violence exists, but hope exists, too," he said. About 9,000 cars were torched in the three weeks of unrest last year, which spread through the country's housing estates - dominated by immigrants and their French-born children. A police official in Nanterre said the bus was attacked on Wednesday by a gang of youths armed with a flammable liquid. "There were at least 10 passengers on board, who only just had enough time to get out. Thankfully there was nobody with any handicaps on board, or it could have ended badly," he told the AFP news agency. Separately, bus routes in the Essonne area, south of Paris, were suspended because of fears of attack. Law and order have become major issues with presidential elections due next year. Candidates from the two biggest parties have promised a tough approach to crime.